Stratford has to have at least one big, impressive, serious classical play a year. 2007- Lear, 2008-Hamlet, 2009-Macbeth, 2010- Tempest, 2011- well, 2011 didn’t have a big tragedy but Twelfth Night was so good and Richard III (in the Tom Patterson) was such a big deal that they made up the difference. In 2012, it’s Henry V. It’s a great text, a really great text, with an awesome lead character and a diverse ensemble that shows off a strong company’s assets from the clowns to the pompous villains to the smarter-than-average ingenue who speaks almost entirely in French. The only real drawbacks of doing Henry V as your flagship production (a duty it’s sharing with the monumentally underwhelming Much Ado About Nothing) are that it’s not household-name famous, and it’s complicated. If it were household-name famous, it wouldn’t matter that it’s complicated. Hamlet‘s very complicated, but no one much cares because they learned the plot during a very special episode of Wishbone. The obscure stuff (not that Henry V is actually obscure, but it’s not exactly Romeo & Juliet) needs to be on the easy-to-follow side because chances are the audience will be hearing the text for the first time. Henry V is actually a fairly simple story, but can be overwhelming to try and follow because there are too many characters, all of whom have backstories that the person next to you knows from their BA in History or that one time when they went to see Henry IV without you. There are whole scenes in French. They, like the rest of the play, are easy to understand without catching (or translating) every word, but the whole experience is far more intimidating than going to see Hamlet. So it needs the sort of cast that makes things easy on the audience- a king charismatic enough that he seems convincing and beloved without the speeches; the kind of actors who make verse understandable and consistently entertaining; the kind of direction that makes the points clearer without undermining the text. The Stratford production does some of those things very well, but I don’t think it’s the sort of show that was all that fun for anyone who came in intimidated. Henry is a character who is at once a hero and a tyrant; he’s a complicated guy worthy of years of scholarship. And those privileged enough to have seen Henry IV know him already and are able to really see those different sides. Those who are just jumping into Henry V are missing lots of information that Drastically informs who he is here. The hidden hero in those earlier plays will always be trying to prove something to his father, he will always be apologizing for his former life, he will always be trying to conquer things (in this case, France) just to prove that he deserves the crown he had to fight Hotspur and expectations to get. That character development is hard to see if you’re faced with Henry without first meeting Hal. But, perhaps most importantly, you lose the gravity of one of Henry’s most fascinating defining moments. The backstory of Bardolph, Pistol and the rest of the Eastcheap gang is crucial to the scene where Bardolph is caught stealing and brought before Henry for sentencing. It’s Henry vs. Hal as their current iteration decides to sentence his old friend to death as a show of kingly strength and discipline. It’s heartbreaking and angering and oh-so beautifully played by the great Randy Hughson in the role of Bardolph. But the audience just seeing this play barely knows Bardolph; and the king has to adhere to the lawful punishment, doesn’t he? My point, to state it a hundredth time, is that so much complexity is lost by staging just Henry V without its prequels, but even if it weren’t diminishing, it’s at the very least unfair to the audience trying to keep more than 40 characters straight without a hint of backstory. 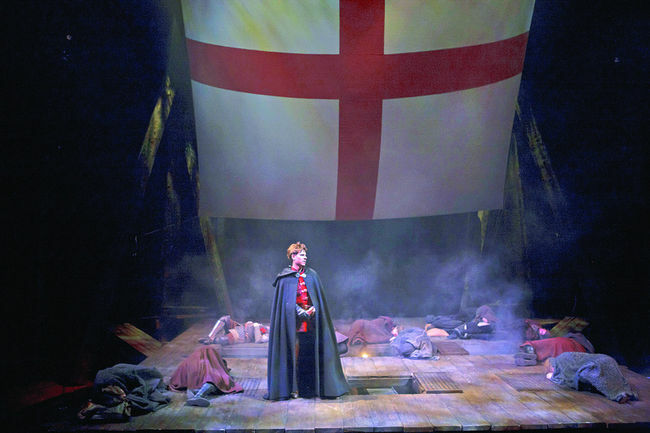 The excellent that is Henry V on paper becomes a perfectly good but not exactly great production in the hands of outgoing artistic director Des McAnuff. His Henry (Aaron Krohn) is capable and at times even likable, but he’s not special in the way that I’ve come to expect from someone given one of the most conflicting and standout roles in Shakespeare’s canon. And it’s his show. If Henry doesn’t steal your heart or make you angry or inspire you to join the armed forces (or all three at once) then the play is just going to be so-so. Gareth Potter offers an amusingly skittish Dauphin and Tom Rooney comes through with a fun but fascinatingly angry Pistol. Ben Carlson is a boring Fluellen (who is supposed to be Welsh, yet somehow sounds exactly like last year’s Sir Topaz) but he was the only person (other than Blendick, whom I never like) who was actually annoying. I expected more from Krohn, but it wasn’t the end of the world. Bethany Jillard, though, is simply lovely as Princess Catherine and her courtship with Henry in Act V is actually his best scene. But the production is mostly just fine. The company doesn’t necessarily let the text down (as is the case with Much Ado), but they don’t elevate it either (which they do manage in Cymbeline). There’s a odd nod to Canada in the end that is nonsensical and forced, but the design and direction is otherwise quite cool (including the use of fun, modern but topical music before, after, and at intermission). In accordance with the Chorus’ instructions that the audience use their imaginations to fill in the stage, McAnuff and set designer Robert Brill do a superb job suggesting epicness with simplicity. The stage is mostly bare, the costumes (though period, designed by Paul Tazewell) aren’t too much, and actors sit astride simple wooden structures that suggest horses. There’s a sort of Brechtian distance to it all that I actually really loved. The best element of that is actually the prologue. Throughout the play, various actors speak the chorus lines as the stage is set for the next act. But for the prologue, the Chorus role is taken by the entire company. They come out one by one, dressed as themselves in rehearsal clothes and using their natural accents, and speak a line or two before taking their place on what will become a stage crowded with diverse and introspective players. It’s a thoughtful and intriguing introduction that plays very beautifully and, at least for me, stole the show. 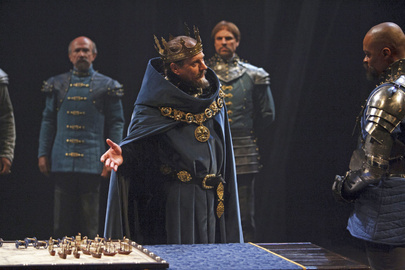 Henry V plays in the Stratford Festival Theatre until September 29th.